Part of our attention this morning will be given to TWTR, and, more specifically TWTR calls, as we’re catching the stock in the midst of rebounding off of it’s lowest price point since the end of July. The stock found support just shy of the $40-mark on Tuesday and registered higher lows and higher highs during yesterday’s session. We’ll look to take advantage of a possible continuation of the trend using the TWTR options chain. The $42 and $43 weekly calls are going to be where we look for intraweek flip opportunities, and for a longer-term swing trade idea, we’ll track the December 12th $44 calls (Last Traded: 1.45). 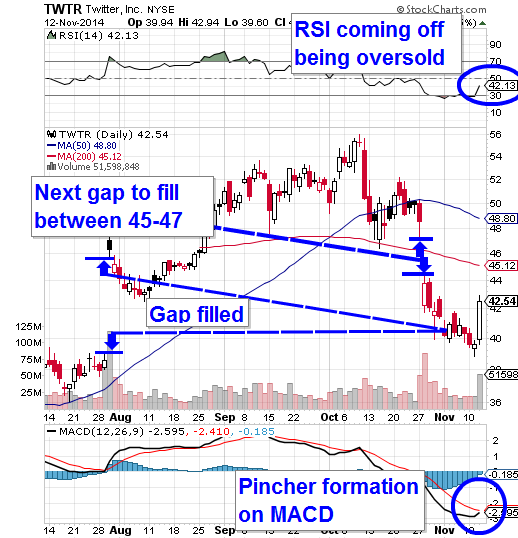 If TWTR can fill the remaining gap on the chart to the $47-range before 12/12 we could be looking at a 100% increase in those calls from here, so it’s going to be something we’ll pay close attention to over the next month. We’re going to be monitoring this play for an early run-up on the untraded-upon earnings report, followed by a possible dip-and-rip scenario. We’ve sniped out rapid gains on both sides of the fence in situations just like this one, just by staying extra vigilant, so ZAZA will be another interesting play to follow as we close out the week. We’ve been tracking JNUG in the wake of last week’s annual low on the price of gold, and as the price of the precious metal has rebounded it has provided us with a few swing-trade opportunities. Initially we saw JNUG run from 3.59-4.44 (+24%), and after pulling back slightly to 3.65 yesterday morning, the ETF ran back to 4.40, an intraday increase of 20% on several times the average trading volume. We want to tag RAMO this morning and add it to our list of cannabis-related stocks; according to a PR we just caught coming over the wires, the company is set to begin clinical testing with both CBD and THC (chemical compounds found in marijuana). We’ve been watching DNDN for a bounce opportunity this week, as the stock has been way oversold of late. This morning it appears as if the stock is trying to gap up slightly, so we just want to throw in a reminder that this stock could turn into a hefty bounceplay at any time. We brought GWPH back for an update just in the nick of time yesterday, as the stock would go on to have a great session, running slightly over 12% from 81.12 to 91.10, which allowed the Options Calls we were tracking to make some incredible moves. If you refer to yesterday’s report, you can see that we radared the $80-85 Calls, and anyone who followed us into the fray was handsomely rewarded! The $80 Calls bulled their way from the open at 2.80 and would trade as high as 10.90 before the day was done. That’s a walloping 289% rip. The $85 Calls did even better, making a monstrous 1757% move from the opening price of .35 to a high of 6.50! That’s quite good enough to mark GWPH Calls down as one of this month’s most spot-on picks. DDD exploded off of yesterday morning’s Extended Watchlist, wherein we tagged the $52-53 Calls. The stock subsequently traded in a range from 51.65 – 54.58 (+5.6%) which opened up the door on another set of winning options plays. The $52 Calls opened at .78, and would run as high as 2.70, a 246% intraday run, and the $53′s traded from .41-1.92, giving traders the chance for up to 368% in profit. Both this and the previously mentioned play are excellent examples of why we’ve branched out from just tracking the stocks themselves, to mentioning so many Options opportunities. The gains are often very impressive, and have become a staple in our day-to-day trading activities. After tracking SWET over the previous few sessions to gains amounting more than 20% we continued to like the look of the chart yesterday morning, putting it in our daily report. The stock pushed its upper boundary once again, this time hitting a high of .027. Congrats to anyone who has been able to take advantage of our timely alerts on this play! After outlining some potential opportunities in the options chain, ISRG behaved as we hoped it might yesterday, and delivered in a big way. The Weekly $385 Calls made a 22% move from 21.50-26.20. The Weekly $395′s fared even better, with a daily low of 11.60 giving way to a 17.02 close; good for up to 47% in profits. There were even big-time chances on the longer term Calls we mentioned, for example, the October $420 Calls ranged from 17.36 all the way up to 24.60, a 42% rip. We’ll continue to track the Call-side on ISRG as provided by a continued trend off of its recent relative bottom. We tried to give our readers advance notice on SWET and the chart’s potential for a nice move up, first bringing it up on Friday, and focusing in again in yesterday morning’s report. We were happy to see things take a northerly turn to kick off the week, as the stock ran 18% intraday from .0193 and reaching .0227, a solid 23% increase from Friday’s low of .0185. We still like the look of things with regard to the chart, and with oil & gas spiking it can provide a boost to solar plays like this one, as we’re now witnessing. We’ll keep SWET on our radar screens as the week progresses, and we wouldn’t be surprised to see further opportunities come down the pipe. GWPH was a stock that we were tracking along with the large group of cannabis-related stocks earlier this year. On January 27th, we had it listed among several plays that we felt could provide continued opportunities, and over the past few months, it has become a real success-story for us. Coming from the $50-range back in late January, the stock made an extremely nice move to the tune of roughly 65% up to the low $80′s. After a period of consolidation in which it came all the way back down to find support at 41.86 (Apr 15th), and we’ve now seen it trend up once again, reaching 79.24 on Thursday, an added 89% increase. So the opportunities have certainly been present, and the stock is gapping up even higher in the pre-market on the heels of an apparently well-received PR released at 7am this morning. We also want to radar the $80-85 Calls on the options side of things, to maximize our potential even further on this play.